In what could have been the first irony of human history, at the very time when the Aryans were subjugating the free people in India, the Jews, in slavery, were enabled by ‘the God’ to escape from Egypt. The God, as though in reciprocity, demanded of the Jews to submit to His Will, made explicit in the Torah. And, as if to massage their ego, besides gaining their servitude, ‘the God’ proclaimed them as His Chosen People. However, to rein them in, He imposed a code of conduct upon them through the Laws He revealed to Moses, the Prophet chosen for that purpose. Besides, as an incentive to their compliance with those harsh Laws, ‘the God’ promised to lead them into Israel, the ‘Promised Land’ for them. Nevertheless, the All Knowing God felt all that might not be enough to ensure an everlasting obedience and the abiding gratitude of His Chosen People. And thus, as though to keep the flock all to Himself, he warned them of their destruction if they ever worshipped other gods. Hence, it is imperative to understand the nature of Jehovah, the Judaic God, and the tone and tenor of the Mosaic Laws to appreciate the life and times of the Semitic people in that distant past. I am Jehovah your god who liberated you from your slavery in Egypt. You may worship no other god than me. You shall not make yourselves any idols: no images of animals, birds, or fish. You must never bow or worship it in any way; for I, the Lord your God, am very possessive. I will not share your affection with any other God! And when I punish people for their sins, the punishment continues upon the children, grand children, and great-grand children of those who hate me; but I lavish my love upon thousands of those who love me and obey my commandments. You shall not use the name of Jehovah your god irreverently, nor use it to swear to a falsehood. You will not escape punishment if you do. Remember to observe the Sabbath as a holy day. Six days a week are for your daily duties and your regular work, but the seventh day is a day of Sabbath rest before the Lord your God. On that day you are to do no work of any kind, nor shall your son, daughter, or slaves - whether men or women - or your cattle or your houseguests. For in six days the Lord made the heaven, earth, and sea, and everything in them, and rested the seventh day; so he blessed the Sabbath day and set it aside for rest. Honour your father and mother, that you may have a long, good life in the land the Lord your God will give you. You must not be envious of your neighbour’s house, or want to sleep with his wife, or want to own his slaves, oxen, donkeys, or anything else he has. “Be very, very careful never to compromise with the people there in the land where you are going, for if you do, you will soon be following their evil ways. Instead, you must break down their heathen altars, smash the obelisks they worship, and cut down their shameful idols. For you must worship no other gods, but only Jehovah, for he is a God who claims loyalty and exclusive devotion. Having thus laid the moral code of conduct for His Chosen People, besides revealing the religious regimen of Judaism, Jehovah advanced the enabling provisions of conformity that came to be regarded as the ‘Laws of Moses’. Understandably, these Laws lay down the prescriptions and proscriptions intended by ‘the God’ for man in the journey of his life ‘here’. What is more, and inexplicably at that, the Mosaic Laws detail the ordained punishments based on ‘eye for eye’ and ‘tooth for tooth’ jurisprudence. As the Mosaic Laws reveal, Jehovah comes out as an Impersonal Being, content Himself at punishing the wrongdoers in a legalistic fashion, rather than concerning Himself with imparting spiritual guidance to the Jews, His Chosen People, for their salvation. Nonetheless, as the following passages from the Torah illustrate, when it comes to His own relationship with them, Jehovah appears to be a very personal and demanding God. Equally significantly, the punishments of disregard too are mundane to the core. Thus, in essence, it seems that the religion of Judaism emphasizes the duty of the Jews to follow the Will of their God, in gratitude for His benevolence of their deliverance from slavery. It was this remarkable covenant of Jehovah, which made them His Chosen People that should have enabled the Jews to brave the pogroms in alien lands for centuries with unrivalled forbearance. Besides, the underpinnings of reward and punishment regimen that their faith inculcates in their consciousness would have served the Jewish people sustain hope in the face of adversity for millennia. On the other hand, Jehovah, for His part, kept His word, first by punishing the Jews as he said He would, and then, in the end, gave them the Promised Land, also as promised. On the basis of the executed threats and fulfilled promises, and going by the recorded history of religions, the Judaism of Jehovah has a claim for authenticity amongst the faiths of the world. Thus, as Jehovah settled scores with the Jews ‘here’ itself, won’t the proposition be valid that, after all, there could be no Hindu swarga, no Christian Day of Judgment and no Islamic Hereafter for man to contend with? And inexplicably, Jehovah, in His Quranic avatar as Allah, revealed to Muhammad that Paradise is for the real for the new faithful. And in times to come, the propensity of the zealot Musalmans to put their lives on line to attain it, though with debatable outcome, has become the scourge of mankind. Continued to "Pyramids of Wisdom"
Thank you Aravind for your liking it made me glad. It is clear that when talking about God’s dealings with man, especially in the ‘quid pro quo’ terms you cite, it is never God’s actual words, but the understanding derived through a human intermediary, as the prophet Moses is, that is couched in terms attributed to God. Since God to the Jews of the covenant is an infinitely exalted being, whose name is too holy to be pronounced, it is clear the expression of God’s desires involve in all cases an intermediary or prophet. The prophet being a mere mortal can only comprehend the ineffable will of God in limited terms of human intellect, and within a specific community of people. 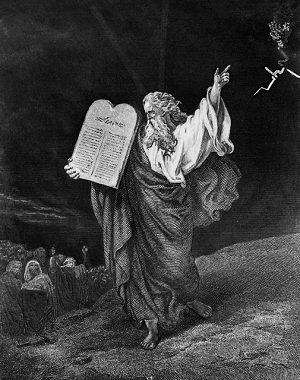 However, once the rules and regulations are set out by the intermediary, they are referred to as God’s commandments. Further, scripture has it that it is an angel that mediates God’s will to the intermediary in all such encounters between God and man, since the holy angels identify with the will of God in all things, and even speak in the name of God. Jesus Christ as an intermediary of God’s Will is radically different: in Christ there is comprehension by virtue of unity in essence with the Divine of the Divine Will, which He expresses as the new covenant of love. The sacrificial shedding of His own blood is alone the requisite atonement for the sins of the whole of mankind; what used to be the daily ritual atonement of blood sacrifice of sheep and oxen performed in the Jewish temple for the sins of its people (the Moses mediated understanding of the Divine Will).